It is no secret that Sangria is one of my favorite sunny day drinks and what does well with warm weather days??? Watermelon, of course. I tried to search Pinterest for a recipe but didn’t really find any combinations of flavors that was grabbing me so I decided to create my own concoction. Directions: Cut up your watermelon into cubes and place in a pitcher, add white wine and Moscato and refrigerate for at least an hour or longer. Once ready to serve pour mixture into a glass halfway then top with 7-Up and add a lemon and lime slice for flavor. Then drink till you’re awesome! Since I like you I will share another quick recipe! This is a refreshing salad that is good for you, but also great for entertaining too! Directions: Slice the plums, tomato, and mozzarella into slices and arrange on the plate. Mix up the vinegar, lemon juice, EVOO, sea salt, pepper, garlic with a whisk and drizzle over the plate and garnish with the basil. I can see this paired with chicken sausage, Chorico, Linguica, or an egg white omelet. It can also be a stand alone appetizer for guests. The original recipe can be found here. It originally called out for peaches but it seems to be out of season so I substituted the plums. If you are not a fan of mozzarella you could also use crumbled feta, goat, or blue cheese. I plan to use the dressing for all my salads from now on, so light but a little spice to it too. YAYY! Now I can make the watermelon sangria! Yum! And I never thought to add plum to my caprese salad… that would be the perfect fruity addition! So glad you linked up with us! It was super yummy! I was so glad I went with the plum, but I am sure peaches or pears would be good too! I’m sold on that salad. looks amazing. I love mixing fresh mozzarella with fruit… you should try mozzarella with mango. so good! Mango sounds like an amazing combination. I have been meaning to make a mango salsa so I can use the leftovers for the salad! Thanks for the idea Amy! OMG. I could totally picture a grilled cheese version being so good!! Watermelon sangria! I never would have thought of that! I bet it was delicious! Hope you’re having a nice weekend! Stopping by from the NE bloggers weekend wander hop! 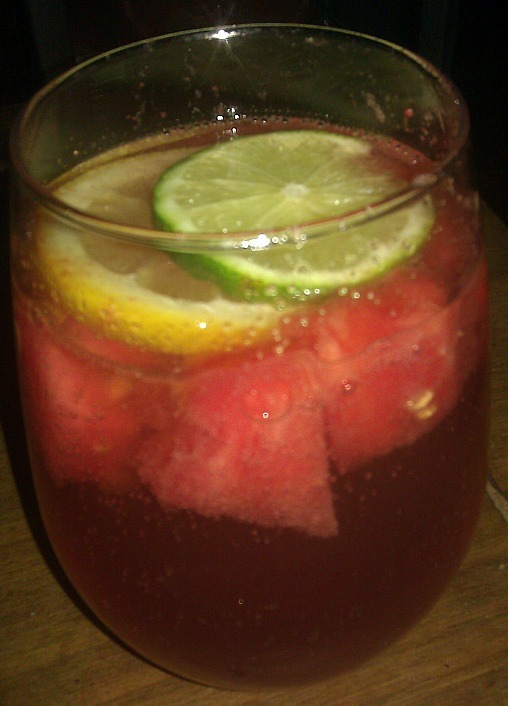 Oh my, Watermelon Sangria! What a clever idea for a summer soiree (or just me and my hubby on the back deck). I will be making this in the watermelon season! Thanks for sharing! Oh, and it is great to find a fellow runner in blog land. I have done 3 half-marathons and a couple of 15Ks…they are addicting! One foot in front of the other! Thanks! It was very light and refreshing perfect for days spent on the deck! Hope you like it! Thanks Ashley! Hope you like it! I think I always had issues with sangria because I never got into wine. But it looks like an interesting recipe! Dropping by via the Northeast Bloggers hop. Sangria and even Moscato is really great for those just starting to get into wine since it is more fruity. Thanks for stopping by P.J.! The salad is so easy to throw together for any meal or snack! Got to have a little something for the grownups too! You could make a kiddie version with just the Watermelon, Sprite, lemon and lime slices. Hope you like it! The salad is beautiful and sounds tasty. I love mozzarella. Enjoy your SITS Day. It was so good and something that can be tossed together fairly quickly! I love it for lazy days in the summer or for nights in watching movies! Ooh, this all sounds very delicious! 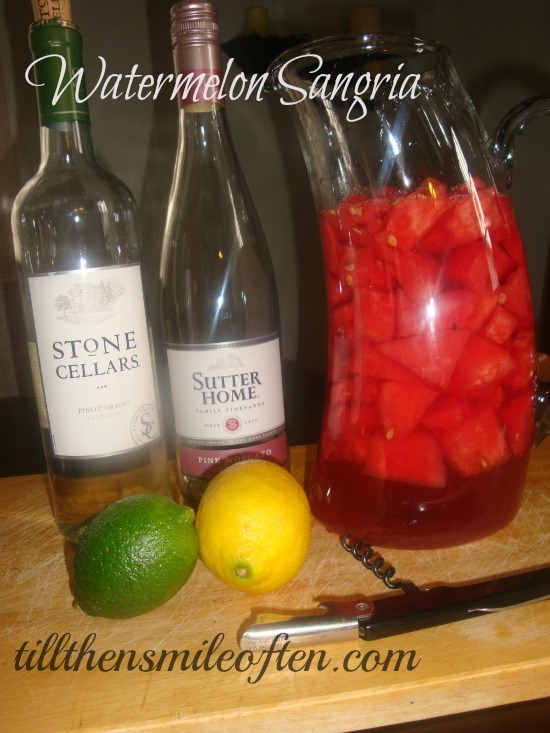 Will have to try out this watermelon sangria recipe next summer. Happy SITS day! It was really yummy and I might make it again before it goes out of season! Ooooh some of our market vendors still have peaches and watermelon, putting this on my shopping list! Tasty!!! Hope you try it, they are both my favorites! I checked out the post for the Watermelon Sangria, but I am in love with his salad too! Plums?! I must try this. Enjoy your SITS Day! Thank you! For some reason I couldn’t find peaches anywhere so decided to go with Plums! So glad I did, it is now one of my favorite recipes! Oh My! Everything looks so delicious!!! I happen to have some watermelon and some store bought Sangria in the Fridge. I wonder if it will taste good using that instead. 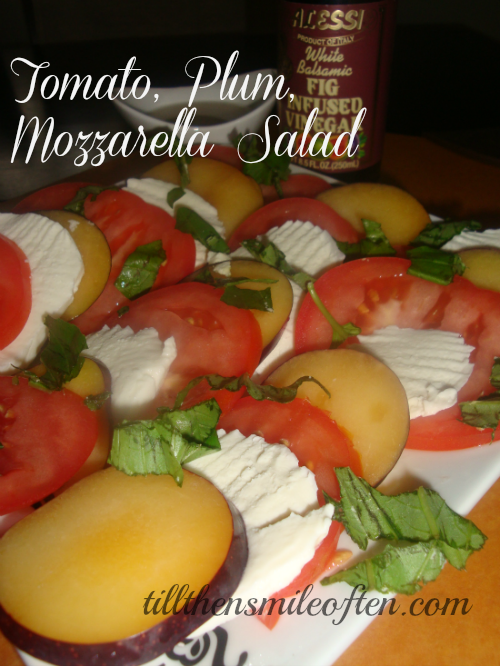 I definitely have to try the tomato, plum, mozzarella salad. I don’t usually eat foods like this unless I’m at a fancy restaurant, though, because I hate doing anything in the kitchen. It should work the same! The perfect thing with the salad is you just slice, plate and add the dressing. Feels fancy but so simple! Hope you try it! Yum…I have a watermelon on my counter right now and a girls’ night planned for tonight. Now I know what I’m bringing! Thanks for the recipe Kerry – have a great SITS day! Perfect timing! Hope you enjoy the food and time with the girls! I’m going to a party next week and the tomato/plum/mozzarella salad will be the perfect thing to bring. It looks delicious!!! Happy SITS Day! Thank you! Hope you make it and like it! I would love to know what you think after you make it! I love watermelon! Perfect for summer!! Happy SITS Day! Thank you! I scored a really good watermelon this weekend so I think I am going to make it again! YUMMY!!!!! I want to make that this weekend!! Happy SITS day! Thanks! I was one of my favs. If you make it let me know what you think! That looks awesome! I was just researching stuff to make with the watermelon back at my house! I’ll have to give this a try. Happy SITS day!